What is Adrenal & Thyroid Fatigue? Pain sensation or severity can be influenced by the pH of the injured body tissue. Identifying whether you have an alkaline or acid pain pattern can help to determine better pain support by altering this with nutrition. In addition men and women have different pain thresholds due to differences in hormones and brain pain perception, with men responding to NSAID’s like ibuprofen better while women have a better response to opioids. Oestrogen increases sensitivity to pain so whether you are a man or woman, if your pain threshold changes, this may indicate problems with your testosterone to oestrogen ratio. Understanding pain is important as chronic disease and cancer can produce pain. Long term use of pharmaceutical pain medication causes all sorts of problems so where pain can be reduced using nutrition then this is most certainly a better path of treatment. Pharmaceutical pain medication has its place but if overuse is destroying your quality of life then other choices need to be made as part of managing your quality of life. Environmental impact – sunburn, cold or heat, bad lighting, dehydration, smells & noise. Chemical impact – petroleum products, heavy metal exposure, pollution, chemicals in personal hygiene products, clothing, water & air such as anti-perspirants, shampoos & conditioners, liquid soaps, hair dye, moisturisers, laundry detergents, household & industrial cleaning fluids, fabric dyes & conditioners, insect repellents & room deodorants. Also asbestos, polyvinyl chloride, chlorine used to sterilise water, chemicals in the paint on your walls & those used on your flooring & those in your workplace as well. They are everywhere & in everything. Psychological impact – studying, relationships, excessive workload, excessive exercise, abuse – both giving & receiving, grief, low self-esteem, disconnection from community & isolation. Where your stress is high &/or constant enough to create the need for your body’s cells to produce an adaptive response, you will feel physical & mental change which may be for the better or for the worse. If you are living a busy life you may not have even noticed changes until the changes stop you from doing what you want to do. How can stress be for the better? Elevation of blood pressure & heart rate Heart pumps blood faster through the lungs to get more oxygen to produce more energy Constant High Blood Pressure damaging Brain, Kidney & Vascular tissue. The above is called a ‘Sympathetic Nervous System Response’ and it allows you to escape or fight the threat. However if the stress trigger occurs constantly over time then a hyper-stress response develops resulting in disease states. Over a long period of time it can also trigger your body to move into a ‘Parasympathetic Nervous System Response’ stage as your cells overload and you can no longer adapt resulting in exhaustion. Arteries and veins dilate so your blood moves more slowly. You may constantly feel hot, flushed and lethargic. This may lead to varicose veins. High Cortisol/Cortisone (and high blood sugar levels) can damage the Beta cells of the Pancreas and may result in Diabetes Type 2. Cortisol breaks down proteins. This includes muscle wastage, weakness, aches and pains, and it may trigger osteoporosis. 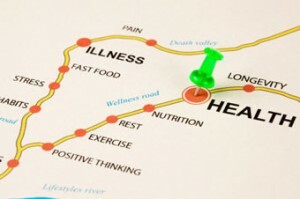 All disease states increase your body’s nutritional needs. If these are not being met then the disease state becomes more entrenched and may even get worse. Do any of these states sound like you? This is bad stress. How do I know if my stress response is a ‘bad stress’? When states of imbalance stop you from living with ‘ease’ then you have ‘bad stress’. If you do not do something about the imbalance it will get worse. Imagine if you then get an infection, like a bad head cold? How well do you bounce back from that stress on top of everything else? Is this the “last straw” that triggers further decline? The best way to describe your response to stress is to use the ‘Stress Pot’. Imagine your ‘pot’ being your coping mechanisms. Every day you add stressors (the impacts listed above) to your pot. Every day you do things to lower your stress (e.g. play golf, have a massage, have fun with friends) and this helps to empty the pot. If you continue to add to your stress pot but fail to remove stressors from your pot then the pot fills to the brim and you reach your stress threshold. Physical and mental imbalance is great. Acute symptoms develop. Your body and mind is telling you that it is out of balance. You feel you can no longer cope. You are no longer fun to be around. You over-react or are unable to react to stressful situations. You may start self medicating with alcohol, soft drink or coffee. If you ignore the signs (e.g. “I’m too busy”) and keep filling that pot, then when it is filled to the brim, or worse overflows, you will be so out-of-balance that you could develop a deep illness that is labelled as a ‘chronic disease’. Whatever disease state you have, will reflect the type of stressor(s) you have, your current nutritional reserves and your genetic heritage. As a Naturopath in Coffs Harbour, that is where I come in. We have HICAPS so you can claim from your health fund at the time of payment. EFTPOS, Visa and MasterCard is available. Log in Copyright © 2019 Anuna Natural Medicine - All Rights Reserved. Web site by Dynamic Web Solutions.